New grant: Expanding Malagasy veterinarians perception of their role in biodiversity conservation. How can I work at a zoo? What do employees at a zoo do behind the scenes? 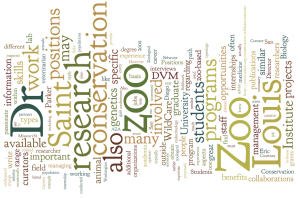 Dr. Eric Miller, from the Saint Louis Zoo, provides students with an insider’s view on the day-to-day responsibilities of directing a zoo, tips on getting hired in the zoo/conservation field, and so much more! In this column of The Naked Darwin, you will find interviews with outstanding professionals that have devoted their careers to different fields of Biology. Here, they share their expertise in their career, and we hope our readers can gain from the knowledge and advice they will share. The interviews are performed by students from the University of Missouri-St Louis, who are taking the seminar “Careers in Biology” offered by Dr. Parker.